“Just make me a shelter,” Marie Gladwish asked of her son, Gary Gladwish, a Seattle-based architect. The seemingly modest request gave way to a period of consideration for Gary, who knew how difficult it would be to create a residence that truly reflected his mother’s subdued tastes. Describing herself as a woodsy, ferny, and mossy person, Mrs. Gladwish prefers the textural simplicity of barn wood, aged steel, and rocks to architecturally inventive structures. For her son, who holds degrees in fine art and architecture from the Rhode Island School of Design, the task of creating this particular domicile posed both a personal and professional challenge. The only building that could provide something of a template for the project—which required integrating the interior with the surrounding environment—was Philip Johnson’s Glass House in New Canaan, Connecticut. 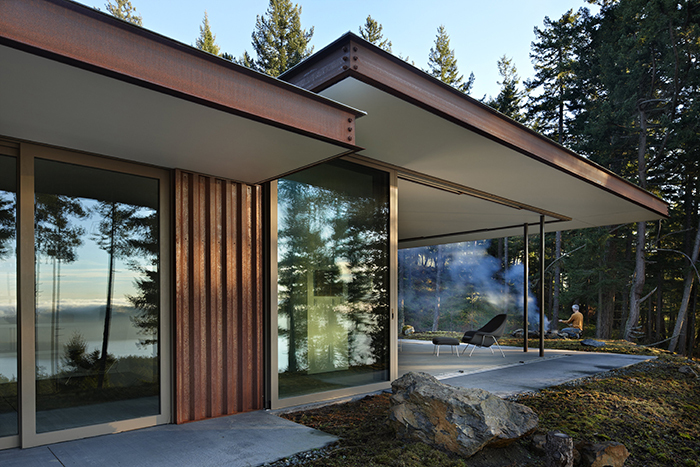 Inspired by Johnson’s appropriation of Glasarchitektur—an idea first conceived by German architects in the 1920s—Gladwish designed the house to open up to the natural landscape by using glass that glides on inline-skate wheels. 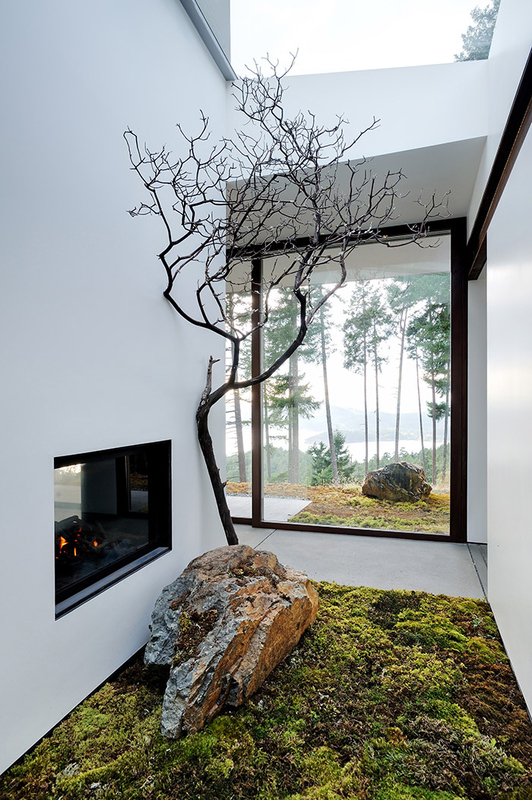 Upon entering the residence, a cursory tour of the home leads one to the false conclusion that trees, moss, and rocks have infiltrated the domestic space, taking up wall-to-wall residence in the foyer as well as the bathroom. Gladwish made use of large-scale terrariums and moss gardens in the design, framing some of his mother's favorite types of flora: thistle, moss, and fir. 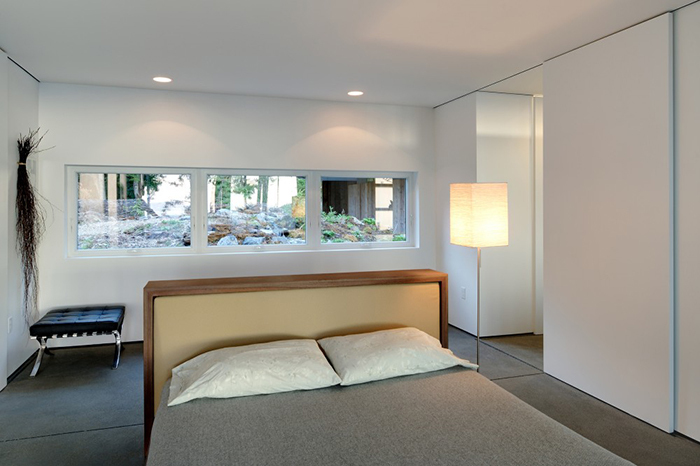 In the bedroom, Mies Van der Rohe’s Barcelona Stool sits in the corner beneath a bundle of tightly-bound reeds and walled-off ferns, juxtaposing the organic with manmade, rational forms. The charcoal grey Saarinen Womb Chair occupies the home's prime real estate. Situated near the juncture of two sliding walls, the chair's backdrop of pine trees encourages reading en plein air. A redolent campfire is only a few yards away, creating a smoky aroma that few brands of incense can compete with. Photograph by Ben Benschneider / The Seattle Times. Featured Photographers: Ben Benshneider and Will Austin.